Have you ever thought about compost? As a gardener, compost is a great source of organic matter as well as fertilizer which can be mixed into the soil when planting. Whenever you do some gardening or planting, using organic fertilizer is a great idea. The great thing with a compost is that it is cheap and helps the soil in water retention where it’s needed. So what makes up a compost pit or what is a compost pit made of? 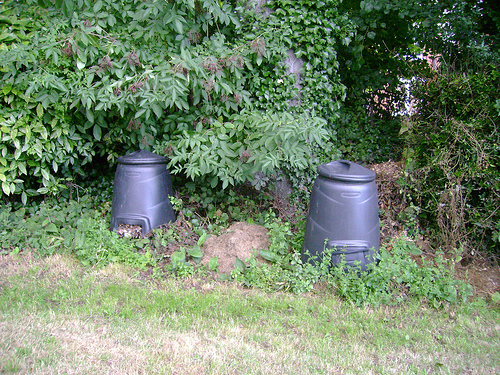 A compost is made up of organic matter like the fallen leaves, trimmings of plants, clippings of grass or remains of other plants. There are fruit peels, kitchen and household wastes, coffee grounds, egg shells and so much more. Did you also know that you can also use shredded papers into the mix? Well, we do know that paper decomposes – just limit the amount of paper added in the compost because the more you add, it will clump together and the longer it will decompose. Though we mentioned that the compost is made up of organic materials, here are some of those organic materials that should not be added in the list: grease, dairy products, meat scraps, or those materials that produces bad odor because these will attract wild animals. It is also a ‘no-no’ to add cat litter or dog and other animal droppings into your compost as they may contain parasites and other harmful organisms. Knowing which organic materials can be used for your compost, you now need to locate where in your yard that you need to allocate for your compost pit project. Keep in mind that the area should be level, have a good drainage and can be hit partially by the sun. Make sure there is a good water source near because you will need that for your compost. 1. Building your compost pit – structure. You can use wires woven together, big barrel, concrete blocks or treated lumber (1 by 4 inch dimensions). If you don’t want to make your own compost structure, you can buy prefabricated compost bins in hardware stores or turf suppliers. 2. Starting your pile. This is where your materials that you collected come next. You need to arrange them in layers. 3. Keeping the pile moist. Always keep a constant check of your pile by squeezing a handful – make sure to wear garden gloves for protection. The compost takes 4-7 days before you are able to turn the pile and mix the materials. Make sure that the pile should heat up and that it should be moist enough. When the compost is done which usually takes six weeks to a year, it should look dark brown and crumbly – soil consistency with a sweet and musty smell. Then you can use them in your garden bed.